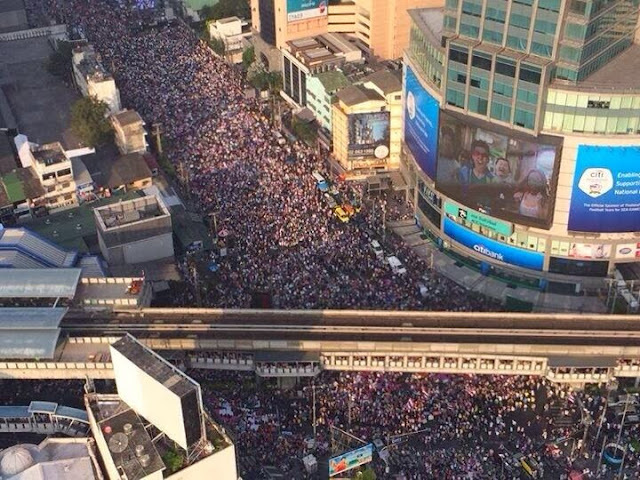 December 23, 2013 (Tony Cartalucci) - For the third time in the past two months, hundreds of thousands of peaceful protesters took to the streets from early morning until late night, paralyzing Thailand's capital of Bangkok throughout the day. Major roads were turned into walking streets as tens of thousands of protesters assembled at each of over 10 stages throughout the city's major intersections. 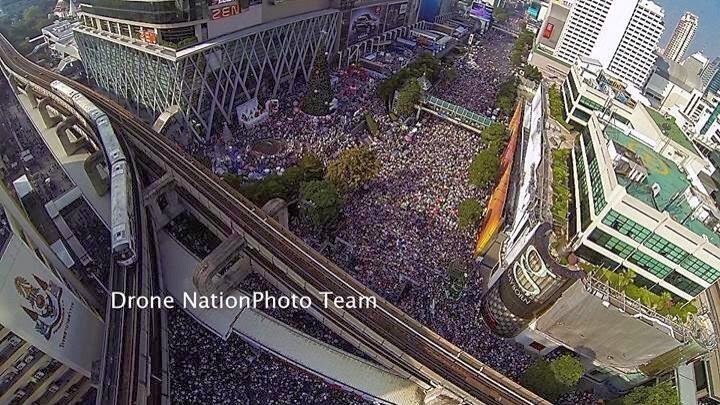 Images: (Top to bottom) Ratchaprasong, Taksin Bridge, Silom, Asoke, & Victory Monument. 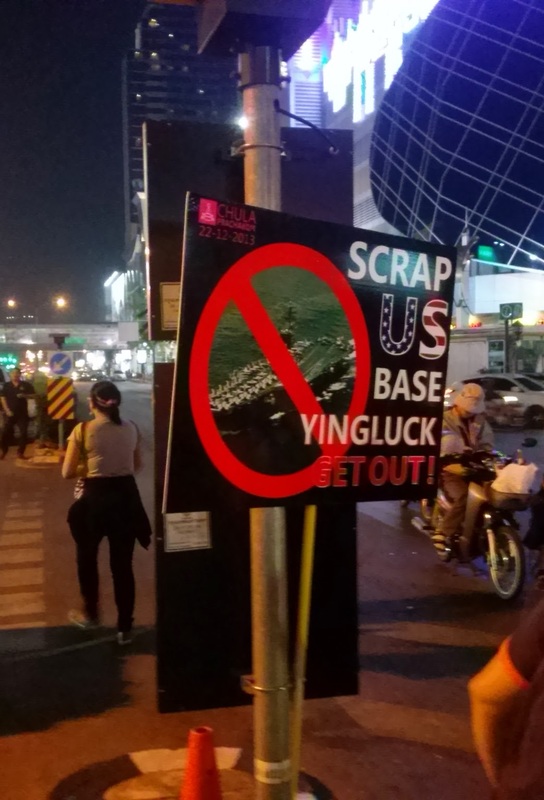 These are images of just some of the separate protest sites and marches organized across the city of Bangkok yesterday, December 22, 2013. Between the sites, a stream of thousands flowed as many participants sought to visit as many stages as possible throughout the day. 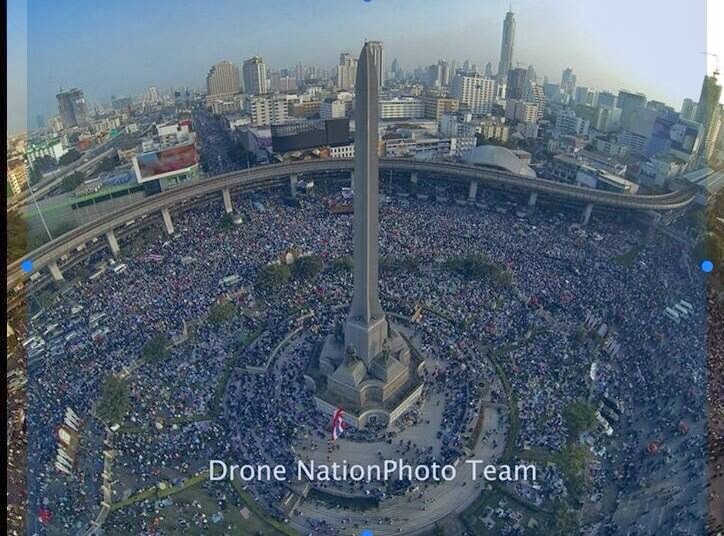 Police dubiously claim only "135,000" turned up, when in reality the number was clearly well over a million. Thousands of protesters streamed between the stages, walking, riding, or driving miles from one stage to the other. 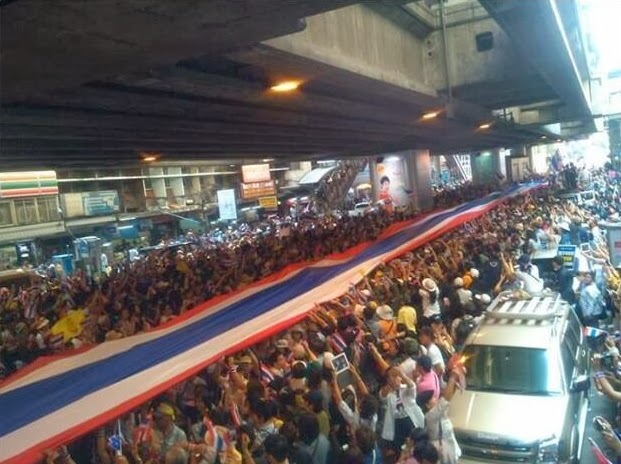 Across the city, in every place of business, the signature Thai flag, ribbons, wrist bands, and banners could be seen carried by protesters as they took breaks to eat and rest. Each protest site was filled to capacity, with a steady stream of people flowing to and from the sites throughout the day. Mass transit systems ran out of tickets and eventually opened gates to let passengers ride for free. 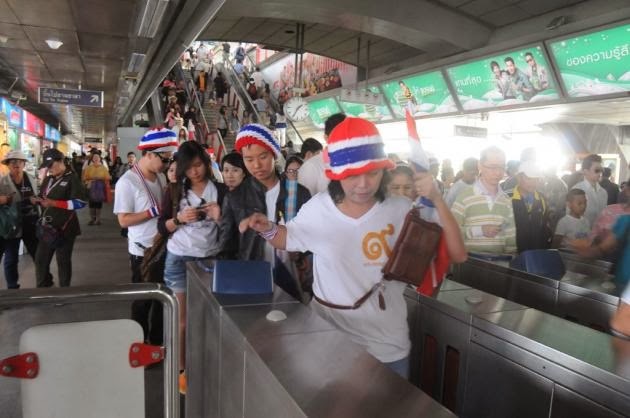 Protest-numbers overwhelm Bangkok's mass transit. The regime's police have claimed the number of protesters at 4pm was approximately 135,000 - which would still dwarf by nearly 3 times the largest pro-regime rallies at the height of its popularity years ago. However, pictures, accounts, security officials and the fact that people were constantly arriving throughout the day as others left to sustain the crowds indicate a million or more turned out. The city's elevated train alone moved over 700,000 people, most of whom were protesters. Meanwhile, the regime's proxy prime minister, Yingluck Shinawatra, placeholder for her convicted criminal brother, fugitive, Thaksin Shinawatra who openly runs the country from abroad as he evades a 2 year jail sentence, multiple arrest warrants and a long list of pending court cases, has fled to Thailand's northern provinces where the remaining stronghold of the regime's "red shirt" mobs desperately attempt to cling to power through a campaign of fear and intimidation. Despite overwhelming opposition, increasing awareness around the world of the cartoonish nepotism and illegitimacy of the current regime, Yingluck Shinawatra was once again placed at the top of the candidate's list for Thaksin Shianwatra's "Peua Thai Party" (For Thais Party) for upcoming February 2014 elections being boycotted by opposition parties. Who are the Protesters & What Do They Want? 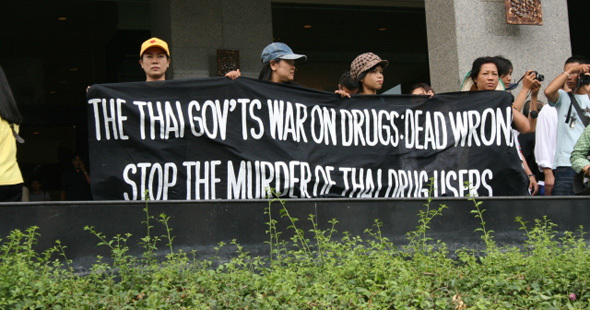 The protesters then, see the privatization and selling off of Thailand's natural resources and infrastructure, the pending FTA's the regime has been attempting to pass, the chaos in the nation's south, the atrocious "war on drugs," and the use of Thailand to serve the strategic interests of the West, in particular the United States, as intolerable. They believe that "elections" and an electorate that continue to return such a regime to power, time and time again, is illegitimate and in dire need of reform. 2. Reform Before Elections - The anti-regime protesters are not, nor have they ever suggested that elections be permanently suspended. Instead, it is recognized that elections now, with no fundamental change to a system that has allowed a mass murdering convicted criminal to run the country by proxy from Dubai will only bring the entire nation back to square one. 3. Restore Article 190 - Article 190 of the Thai constitution requires that all treaties be approved by the parliament before they can be signed. In 2004, this mechanism had prevented Thaksin Shinawatra from unilaterally passing a US-Thai free trade agreement, and was one of many attempted circumventions of the law that led to his ouster in 2006. His nepotist-appointed sister Yingluck Shinawatra, has now managed to amend it making it possible for her to unilateral approve treaties (specifically unpopular FTA's). Protesters would like to see this reversed. 4. The Re-Nationalization of Thailand's Oil - Thailand's oil giant, PTT, was privatized and sold off to foreign multinationals under Thaksin Shinawatra in late 2001. Tremendous wealth has been siphoned out of Thailand and sent overseas, particularly to Chevron, one of the many sponsors on the US-ASEAN Business Council that directly supports the Shinawatra regime. 5. Keep Thailand Anti-GMO, Anti-IP - The current Thai establishment resisting the Thaksin regime has been stalwartly defending against GMO and "intellectual property" (IP) laws pushed on them by the United States, the UK, and the EU. In fact, one of the main points of attack by Thaksin Shinawatra's Washington lobbyists, was attacking the military council that ousted Thaksin for ignoring US pharmaceutical patents while producing cheaper drugs for poor patients. Regarding GMO, Monsanto has been desperately trying to overrun Thailand's food security but to no avail. Would it surprise readers to know that the US-ASEAN Business Council directly supporting Thaksin Shinawatra and his political machine also includes Monsanto? 6. Keep Thailand Sovereign - It was recently revealed that the current regime hired the US lobbying firm of Davenport McKesson to, among other things, help arrange the building of a US Navy base in Thailand. Of course, considering the other demands of the protesters, this is unacceptable. Not only must this deal be investigated it must be rolled back and the mechanisms that have allowed it to proceed as far as it did in the first place, be taken apart permanently. Students from Chulalongkorn University had brought up this issue at the Siam site yesterday and signs denouncing the US Navy base had already begun to circulate. The regime has since denied this, and the original PDF found on the US lobbying disclosure site FARA has been promptly taken down (it can be found here on Scribd). Protesters had promised to open roads late Sunday and promptly did so. The masses shifted from the multitude of stages across the city to the permanent protest encampment at Democracy Monument in the old quarter of Bangkok. 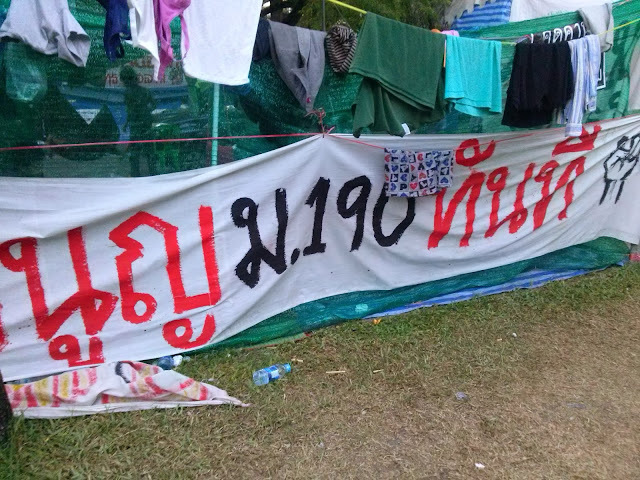 Others moved to Bangkok's Din Daeng area to surround the police station and the site where the regime plans to hold registration for an election only they will be running in. The goal is to disrupt this and prevent even show elections from taking place - forcing the regime to further expose its illegitimacy and eventually collapse. For Thaksin Shinawatra and his foreign sponsors, they can afford to cling to power to the bitter end. After all, neither has anything to lose, and everything to gain. It will be their proxies who pay the price when the inevitable happens - and the longer they help Thaksin cling to power, the graver the consequences will be when they finally fail. The anti-regime forces have proven they can mobilize unprecedented numbers time and time again, and have demonstrated that not only are the protest leaders becoming better organized and their message spreading, but those under their various banners are also becoming better organized in smaller, smarter groups. For the regime, the prospect of "riding out" unrest is not an option.